Scripts are very useful when chatting in IRC, but definitely not something that is common knowledge for beginners in IRC. 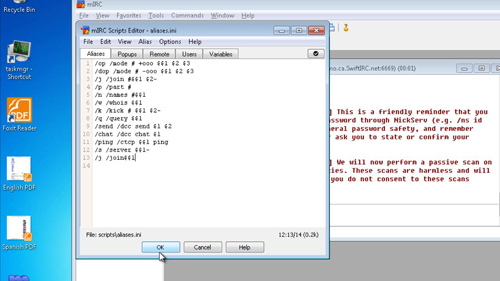 In this tutorial, you’ll learn how to use some basic IRC scripts in mIRC. This tutorial assumes that you already have the mIRC client installed. Go ahead and press “Alt+R” on your keyboard. This will open the scripts menu. Click on the “Aliases” tab and try typing “/j /join $$1”. Saving this script will allow you to simply type “/j #channelname” into the IRC chat box to join that specific channel, as opposed to having to type “/join #channelname”. This only save 3 character strokes, but it is an example of what else you are able to do with Aliases. 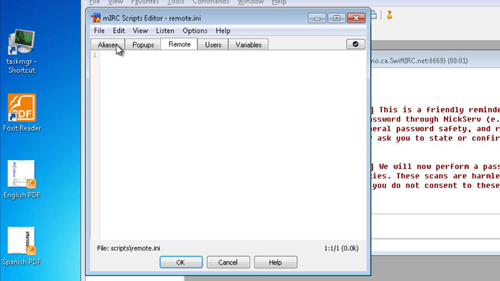 There are plenty of other commands that you can create, the site “http://www.ircbeginner.com/” is a great place to start learning IRC scripts. There are plenty of examples and details here. You now know some very basic steps to getting started with IRC scripts in mIRC.